Don’t forget the most important person on your list, you! See something you like, it’s ok to give yourself a little something too! That’s what self-care is all about. 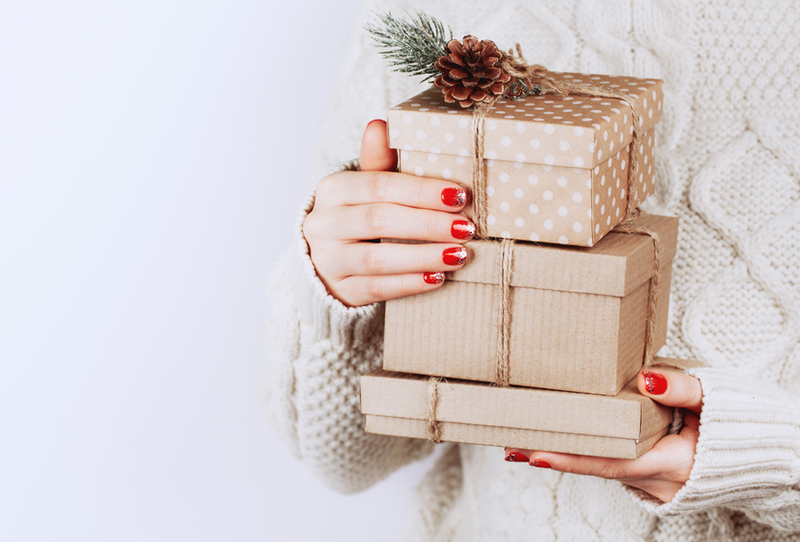 Holiday Spa Packages – New This Season! This spa package takes you on a journey to pure bliss! Personalize this gift for whatever spa service is the best fit – pick a fabulous facial or massage. Either option is the perfect pick-me-up. At $150 it’s a great option for your mom to your BFF. 60-minute facial OR massage – your recipient can choose when they make their reservation! Relax & Renew Kit – Take home the benefits of the spa. This 4-piece kit includes everything needed to relax and let those worries float away. Serene Bath Salts and Stress Relief Bath & Body Oil will make the absolute perfect bath at home. Moisturize with the relaxing Lavender Body Lotion to continue the mood. Finally, spritz your linens with the Tranquil MultiSpray to ensure a great night’s sleep. The name of this package says it all – this gift is a perfect spa retreat. Enjoy head-to-toe TLC with the best facial you’ve ever had and a fabulous massage. You or your recipient will emerge from this escape feeling completely relaxed and renewed. Relax & Renew Kit – Continue your de-stressing at home. This 4-piece kit includes everything needed to relax and let those worries float away. Need a few gifts that aren’t quite that generous or looking to enhance the gift packages above? The below gift sets range from $17.95 to $46.50, scroll through to find the perfect fit for everyone on your list that also matches your budget. 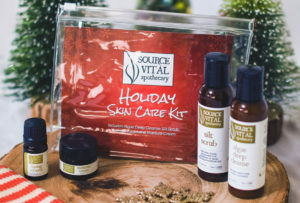 These gift sets will give your recipient a healthy, radiant complexion, and they’re made with all-natural ingredients. Care and protect the skin with high quality skin-loving ingredients. This gift set is a great way to start an effective skin care routine or to keep the skin glowing after a spa facial. Plus, Source Vitál is based right here in Houston, so you’ll feel great supporting a local brand. The perfect stocking stuffer – especially for friends or family who love to travel. Algae Deep Cleanse (2.23 oz.) – This peppermint-infused cleanser is a customer favorite. Toning Infusion (0.23 oz.) – Give your complexion a boost with this active facial serum. Silt Scrub (2.23 oz.) – This gentle but effective exfoliant will make your skin feel extra smooth. Moisture Cream (4.4 oz.) – The perfect everyday moisturizer! Rhonda Allison products are natural-science based skin care line. This “mini facial” lets you take the spa home with you! Use this gift set to give your skin an energy boost. Those beauty mavens on your list will love adding these products to their daily routine. Milk Mask (15 ml) – Made with 100% pure milk protein, this mask is perfect to sooth all skin types. Cherry Jubilee Enzyme (15 ml) – Smelling just like cherries, this formula contains effective enzymes that gently exfoliate your skin while powerful antioxidants protect the complexion from damage. Infuse 7 (10 ml) – Use this serum after the facial to keep your skin feeling soft for days. This system will nourish and hydrate your skin like never before. Perfect for dry skin and protecting all skin types from cold weather, which we really do get from time to time in Houston! Treat your mom or other special women in your life with this little luxury. Creamy Milk Cleanser (30 ml) –Extremely gentle, this cleanser is perfect for any skin type. Infuse 7 (10 ml) – Filled with vitamins and antioxidants, this serum instantly hydrates dry skin. Pro Salve (15 ml) – This healing balm is great to protect skin after chemical peels. It can accelerate cell renewal and is very soothing. Cucumber Spritz (30 ml) – All-natural face and body spray is great for during the day or when traveling to keep skin refreshed; think of it as giving your skin a drink water. Brighten and protect those eyes! 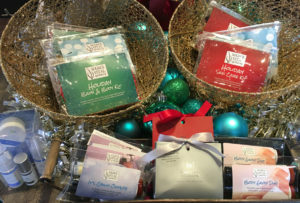 This gift set is the perfect gift to keep you or a loved one feeling and looking refreshed for all holiday engagements. Give to all the ageless beauties on your list. Moisture EyeZyme (10 ml) – Filled with antioxidants and pomegranate enzymes, this eye mask will keep your eyes hydrated. Eye Revitalizer (10 ml) – Cooling cream that will freshen up your eyes – perfect to use after a long day! Eye Mask (one) – Use as a special treat during the holiday season. Pamper the body and soul with these all-natural aromatherapy-powered gifts. Don’t forget the men on your list! Body and personal care products are for everyone. 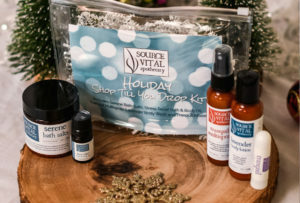 Curated with some of Source Vitál’s most popular products, this kit banishes stress, keeps you smelling fresh and clean, and promotes touchably soft skin. Lavender Body Lotion (2.23 oz.) – Enjoy silky-smooth skin, and enjoy the soothing lavender scent. Stress Relief Bath & Body Oil (0.23 oz.) – Combat holiday stress! Lemongrass Body Scrub (2.23 oz.) – The lemongrass scent will leave you feeling fresh and clean. Deozein Natural Deodorant Spay (1.01 oz.) – Source Vitál’s best-selling product for good reason – it works! This all-natural deodorant does not use any potentially dangerous aluminums, baking soda, or other irritating ingredients. This gift set has a little bit of everything! Perfect for spa-newcomers or those who like to switch things up and try out new products. 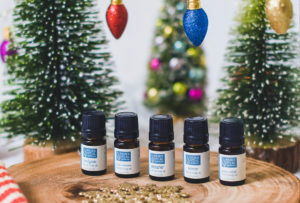 Packed with products designed for deep relaxation, the teachers on your gift list will love using this set to recover from the busy fall semester. Serene Bath Salts (4.4 oz.) – Perfect for a relaxing bath after holiday events. Stress Relief Bath & Body Oil (0.23 oz.) – This oil will add a boost to your bath and body ritual, allowing you to relax and unwind. Tranquil MultiSpray (2.23 oz.) – Enjoy a great night’s sleep by lightly misting sheets and pajamas before bed. Tranquil Inhaler – A great pick-me-up for any time of the day. Lavender Body Lotion (2.23 oz.) – Use for soft, silky-smooth skin! These oils will promise the ultimate aromatic bathing experience. 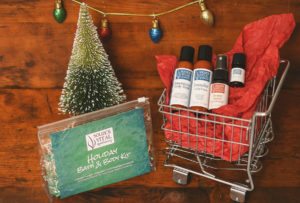 This gift set is perfect for someone who needs to make more time for self-care and relaxation. Yogi’s will love using these aromatherapy blends to help them connect to their moment of Zen. Analgesic Bath & Body Oil (0.23 oz.) – Use for achy feet and sore, overworked muscles. Athletes are big fans of this comforting blend. Fluid Reduction Bath & Body Oil (0.23 oz.) – Great for swollen ankles and relieving discomfort associated with hormonal imbalance. Stress Relief Bath & Body Oil (0.23 oz.) – Use this on pulse points or in a bath to ease the feeling of stress and tension. Serene Bath & Body Oil (0.23 oz.) – This product lives up to its name – this oil is deeply calming and relaxing. Renew Bath & Body Oil (0.23 oz.) – Feel refreshed and ready to take on the new day. Great to use after all the holiday sweets! This gift set allows for customization, providing you with a personal gift you know someone will love! With our wide selection of body lotions and scrubs, you won’t have any trouble finding the perfect scent or formula. Specially packaged to easily fit in most stockings! 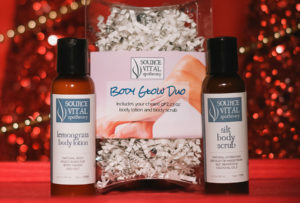 (1) Source Vitál Body Scrub (2.23 oz.) – Choose from: Silt Scrub with freshwater colloidal silt or cream Lemongrass Body Scrub made with red algae. Want even more gift ideas? Check out our full spa menu that includes facials and skin care, massage therapy and body work, hydrotherapy, wraps and scrubs, and a collection of fabulous spa packages. Or choose a Sanctuary Spa gift card for the ultimate personalized gift. Happy shopping. We wish you a Merry Christmas, Happy Holidays and safe travels!